A long time before she adopted me, Mum had another cat. Her name was Suzy and she lived with Mum until she went over the Rainbow Bridge at 13 human years. She went to live with Mum when she was a tiny kitten and Mum was a very young woman, a teenager actually. Well, today is the anniversary of when dear Suzy passed away and Mum is sad. She is remembering her over on her Purrs Full Of Love Blog so please visit. In the meantime, here are some pics of Suzy. 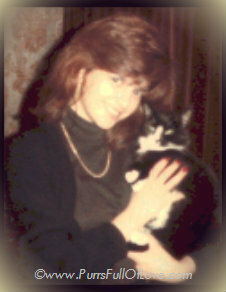 She was a very pretty cat (and Mum says she wasn't as wild as me!). 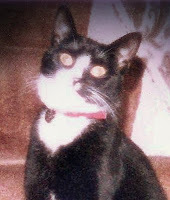 Purrs to your human - mine still misses the cat before me, who died in February, 2002. She thinks about her all the time. Aw, Suzy was so cute. Purrs to your mom as she remembers her today. Suzy was a sweetheart. We know how your Mom feels. 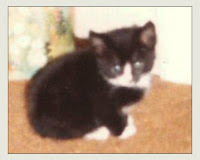 Mom has a tribute to her first kitty that will be posted this Tuesday in honor of the day he crossed the bridge. Athena Cat Goddess is a participant in the Amazon Services LLC Associates Program, an affiliate advertising program designed to provide a means to earn fees by linking to Amazon.com and affiliated sites. "Hi, I am Athena, a rescue cat living in England. I was adopted by my mum Marie. We are soulmates and together we write this blog and have super fun being creative. We also help to promote pet adoption and to raise awareness for animals in need worldwide. We write to save lives! Help us raise funds for cat shelters with Athena's own rescue story! Thank You ToonPetz.com for the Cartoon Version of Me! Click on image to get your own pet portrait by Louisa Houchen! Join our Photo Art Blog Hop! Adopt a Tuxie this #tuxietuesday! Get this Spiral Notebook from Redbubble! (c) All photographs and content copyright of Marie Symeou unless otherwise stated. As Featured in Top Cat Blogs! We're in the Top 45!